Modsec2sguil is a Perl script that feeds ModSecurity alerts to Sguil, the Network Security Monitoring (NSM) system. The 0.7 release works as a drop-in replacement for Snort's barnyard. The new 0.8-devX release currently in testing works as a real agent, but it only supports Sguil 0.8.0. There is some documentation in the tarball. Modsec2sguil is Open Source under the GPLv2 license. It was written by Victor Julien, but also contains some code copyrighted by Ivan Ristic. Screenshot of Sguil 0.7.0-CVS with a ModSecurity alert. - Catch errors in syslog so they will be non-fatal. - Fix broken syslog level. - Add option to log all transactions, not just alerts. - Fix a bug where the agent would exit if the connection to the server was lost. - Make sure alerts get prio 1-4, non-alerts prio 5. - Clean up SguilAgent.pm rtgenevent function. - Fix rule id being part of the event. 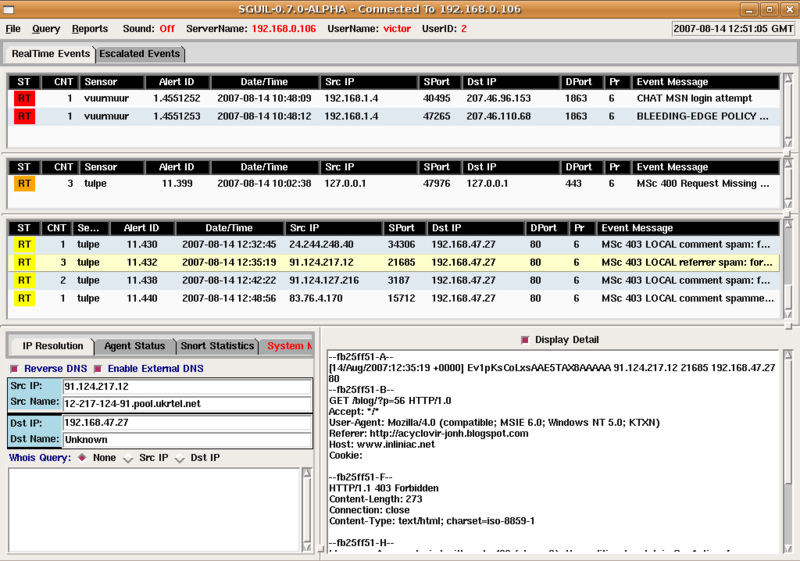 - Add option to send all http events to Sguil, even non-alerts. - Fix missing RUNAS van causing a error message. - Add an option IGNORE_HTTP_CODES to the config, to optionally no treat certain codes as alerts, and thus not send them to Sguil. - add support for ModSecurity 2.x alerts. - fix wrong severity to prio conversion. Last updated: March 26th, 2008.